This probably isn’t the world’s smallest balcony, but it’s so unamenable that it almost makes the door look like one of those trick doors that lead nowhere. Add that to the ladder that leads nowhere either and you’ve got an overall strange alleyway. I like the gritty urban tone of this one – well done. Thank you! Urban photography is probably my favorite. 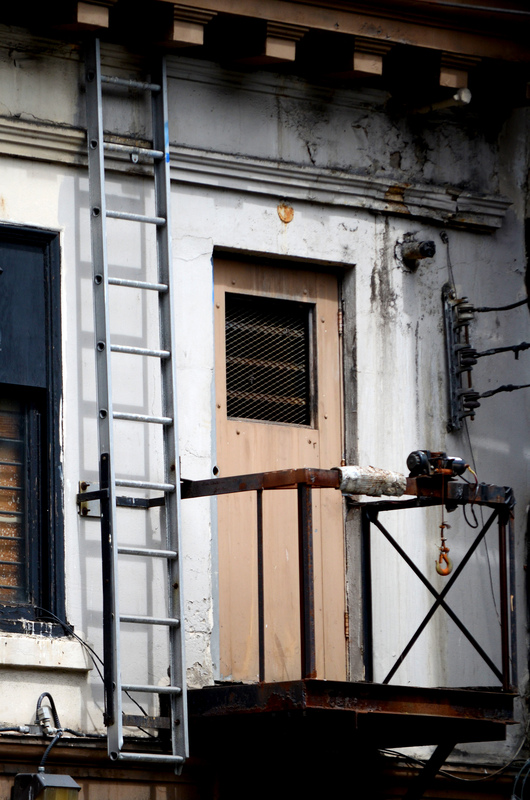 Looks like the ladder on this fire escape isn’t working anymore….great photo! Good eye to even see this as a photo! That’s what happens on photography trips! Everything becomes scrutinized. I love it. I love when kids get their hands on cameras and their whole perspective changes. This is a mind bending photo. I’m wondering if the ladder was part of a fire escape, maybe the balcony was too. It looks like a winch attached to the balcony. I would worry about lifting something too heavy and pulling the whole thing down. I like this photo a lot. Thanks Dan. I think the ambiguity of it definitely makes it interesting. A strange alleyway that makes for a REALLY cool picture. I love this!